This setup may or may not be shared with other kinds of phone. To be on the safe side, only the setup for BT200 phones is defined below. You can find the BSDL file in this BSDL zip where it is named sprm158.bsm instead of tms320vc5501pgf.bsdl like above. The crystal has a period of 60 ns, so it gives out a frequency of about 16.2/3 MHz. More accurately, the frequency is 16.384 MHz. After division by four, the remaining fast peripheral clock SYSCLK1 or CLKOUT is 4.096 MHz. This is also what drives the timers if the internal clock is selected as a source. 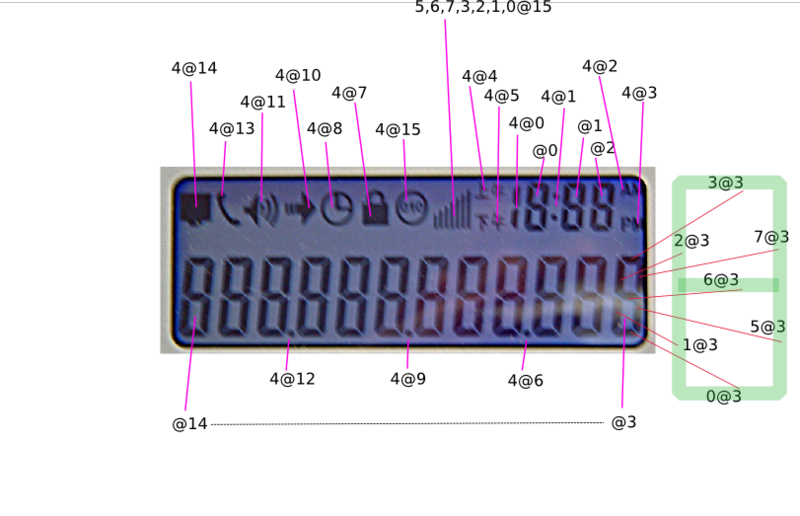 We will setup timer 0 as a general timer, after dividing by 4096000 to get ticks with 1 ms resolution. 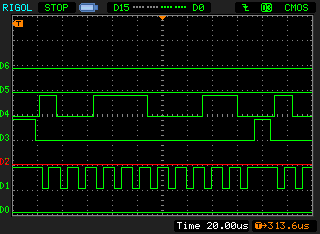 This can be done in the first/prescaler 32-bit half of timer 0, and then the second 32-bit half can be read as a millisecond-resolution timer that can describe periods of up to 49.7 days. The hook contact is connected to GPIO5. When the horn is on the hook, this input is 0, otherwise it is 1. TODO: Is readout over JTAG possible? Is it useful?? These settings are already part of the ones for keyboard scanning, below. bt200bs force high BDX(0)   # on? bt200bs force low  BDX(0)   # off? Admittedly, doing this over JTAG is a tad bit more complicated than the problem requires -- but it could be a good exercise to see if JTAG is working. Believe it or not, but this was the last piece in reverse engineering the phone. I've had to tell people that 99% of the hardware was understood, and then point to this LED as the last bit of knowledge missing. The trouble was that it was wired through resistors, so that my ohm-meter would not beep for a connection, and through a NOR port that acts as an inverter. Also, it was routed over the back of the PCB, making it hard to co-ordinate measuring pins on both sides. Alas, it was no match for determination, of course. Anyhow, the Message LED is driven from the XF pin. This is operated with dedicated assembly instructions, bset xf and bclr xf. With this knowledge in place, 100% of the BT200 hardware has been reverse engineered. As expected, driving this bit was trivial; it took me seconds to implement. Much to my surprise, a potential GPIO pin from McBSP0, CLKS0, cannot be used as this is input-only. Had that one been used for the keyboard, a signal that could function as output would have been freed up, making it possible to do all the "extra" work for keyboard and LEDs through McBSP0 hacks. The keyboard is a 5x5 matrix with active lines D0-D4 and passive lines C0-C4 on peripheral connector J403. Clever as this trick may sound, it rules out a nice facility, namely to make a tickless bottom layer for the 0cpm tickless RTOS. That is because it does not seem possible to read this keyboard without active scanning; the incoming C0-C4 lines have no facility for interrupts on change. Had it been me, I would have preferred to combine selected D0-D4 scan rows into one interrupting input, perhaps through a port or series of diodes. That way, it is possible to sleep continuously while no keys are being pressed. Phones are usually inactive, and having them sleep deep for long is a good idea. Scanning the keyboard while a key is pressed is much less expensive. The current solution uses a D-flipflop chip, which is useless for storing the columns to watch; given no reason to retain the column for interrupt stability, columns might just as easily have been taken from the address bus! Specifically note that the lines D0-D4 are not available to the LCD. The chip clocks DATA in on a rising edge on WR. It should be possible to use CS to avoid disrupting the LCD during other work, such as scanning the keyboard. I do not understand why RD is available, as I cannot trace a link for DATA back to the DSP chip. It appears that the peripheral interface was designed separately, before the rest of the phone. The uselessness of reading from a deterministic output-only device may have dawned on the designers at that later stage.